Shinkai. Architectural installation by Yumi Kori, sound installation by Bernhard Gal, premiere at ISE Foundation, New York City 2006. Bernhard Gal and Yumi Kori create audio-architectural installations. Since 1997, they have explored the interactions between aural, temporal and spatial situations and their influence on human perception and imagination. Their installations have been exhibited internationally, in cities including Berlin, Tokyo, New York, Seattle, Basel, and São Paulo. Conceived in response to the distinct specificities of the ISE gallery, this installation transforms existing properties and characteristics to reveal an entirely new spatial experience. The exhibition’s title is shinkai – Japanese for “deep ocean” and the name of the world’s deepest diving manned submersible vessel. Central to Yumi Kori’s artistic and architectural practice is the transformative power of light. Incorporating only limited additional elements, Kori guides her viewers to a place where the invisible becomes visible and time and space collapse. With shinkai, Kori confronts the ISE gallery’s particular sense of finitude due mainly to its windowless, basement location. Her intervention evokes a dissolution of physical limitations, giving way to suggestions of what lies beyond the gallery walls. Bernhard Gal's sound installation serves as the appropriate acoustic complement of this situation. His composition for shinkai is partly based on existing sound sources recorded at the ISE gallery space. Sounds of rain drops are frozen into acoustic stills, drawing an acoustic image of being underwater where space and time are perceived in a different way. 'Making a Home: Japanese Contemporary Artists in New York', from October 5th, 2007 to January 13th, 2008.
great essence of balloon sounds. the visual of oneself in the surreal scene. one is drawn to the edge, the spaces in-between, the fine details before the abyss. the off-limits of the art itself and its visual buoyancy brings one back out. The Japan Society made a home in New York in 1907, bringing Japanese art, history, and culture to this multicultural mecca. Continuing its centennial celebration, the organization is home to the spectacular "Making a Home: Japanese Contemporary Artists in New York," a multimedia celebration of Japanese immigrants who now live and work in the metropolitan area. Featuring installations throughout the gallery’s three floors, "Making a Home" is a thrilling collection of fascinating, involving works. Visitors are greeted at the upstairs entrance to the main gallery by Momoyo Torimitsu’s "Willingly or Unwillingly, You Are Welcome," a temporary reception desk where a staff member presents you with Yoko Ono’s "A Hole to See the Sky Through," one of three interactive pieces by the avant-garde artist. The exhibition is divided into six sections that tell the story of life, love, and loss through the work of thirty-three artists who left their homeland to make a new start here: "Building Environments," "Intimacy and Identity," "Coping with Loss," "Meditative Space," "The Process of Making," and "Referencing the Landscape." Using Sumi ink and drawing directly on the wall, manga artist Hiroki Otsuka created "Evening Calm Union," a black-and-white rendering of women floating in clouds in and around a city skyline. Hiroyuki Nakamura fills his captivating trio of acrylic paintings of androgynous naked cowboys with mystery and an ambiguous sexuality. Emiko Kasahara’s "SHEER" is a walk-in room made of acrylic plastic and nylon stockings where people have recorded in all different languages their personal stories of loss, coming together for a cacophony of innate sadness. Hiroshi Sunairi’s funereal "White Elephant," a black room littered with clay pieces of a white elephant, recalls both his hometown of Hiroshima and the events of 9/11; Sunairi was stuck in an A train at the Church Street Station, on his way to the immigration office, as the World Trade Center was hit. 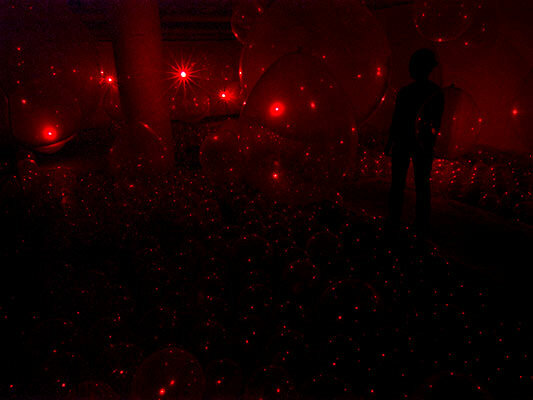 Yumi Kori’s "Shinkai" offers visitors the opportunity to meditate in a dark, red room of tiny lights, mirrors, and balloons that seem to go on forever. Among the other highlights — many of which are filled with great humor — are ON megumi Akiyoshi’s groovy "FLOWER Gallery," Noriko Ambe’s intriguing cut-paper pieces, Ayakoh Furukawa’s wall of drawings depicting different deaths for her deceased pet hamster, Yoshiaki Kaihatsu’s styrofoam "Happo-Tei Teahouse," and Katsuhiro Saiki’s "Study for Metropolis" series, comprising photos of buildings that he reshapes into unique constructions. The beautiful catalog includes a detailed look at all the artists in the exhibition as well as several essays, a critical biography of Kusama Yayoi, and hundreds of color plates. "Making a Home" has found quite a home for itself at the Japan Society, but alas, it’s only temporary, running through January 13. Don’t miss it. with creating a timeless, boundless atmosphere. “In my architecture, I always want to create flexible boundaries, which is a very traditional Japanese approach,” said Kori. “As an artist, I can focus on the aesthetic aspect of what that means. It is architecture without function, a site transformed to create a sensation.” Kori and collaborator Bernhard Gal recorded and manipulated sounds at the site—the wheezing of a boiler, the vibrations of the subway passing by — to further the idea of experiencing what is beyond the gallery walls.